Satellite cells are myogenic cells responsible for muscle growth shortly after birth and muscle repair/regeneration during adulthood. Therapies based on satellite cells hold promise for treating muscular dysfunctions. Studying satellite cells is technically challenging owing to their low abundance, small size and anatomical dispersed location between the basal lamina and the sarcolemma of myofibers. 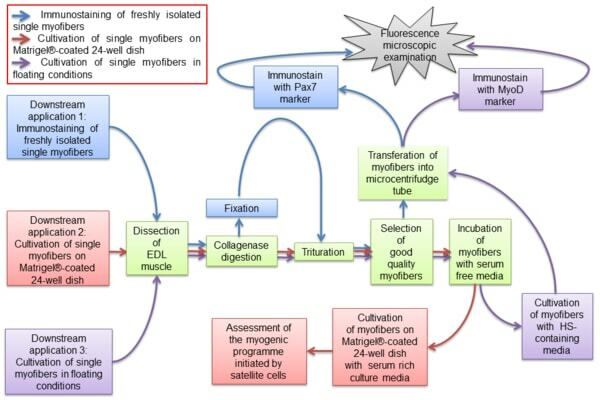 In this article, we present three improved protocol strategies for studying the properties of satellite cells of the mouse during the different stages of muscle regeneration: (1) immunostaining of freshly isolated single myofibers to facilitate the study of quiescent satellite cells, (2) cultivation of single myofibers on Matrigel®-coated dish to study the myogenesis programs initiated by satellite cell activation, and (3) cultivation of single myofibers in floating conditions to analyze activated satellite cells or the doubling time of satellite cells in myofibers. In brief, when compared to previously published protocols, this article presented an improved protocol that requires shorter experimental time and less laborious approach for higher yield of intact single myofibers for downstream analyses.